Viyella has a heritage that can be traced back to 1784 and is the oldest BRANDED Fabric in the World. Today we use the skills and expertise of our forefathers to bring to you a beautiful practical Shirt, one of the only garments in your wardrobe you can hand down the generations. Combining a blend of Wool & Cotton together in the same thread to create a Strong but soft fabric that will keep you “Warm when it’s not and cool when it’s hot” the unique natural properties of these two natural fibres work together to creating an intimate blend. Modern technical fibres offer this today, however Viyella was the first and most Natural performance fabric Centuries ago! Coupled with a make of strong twin needle seems added length and generous shoulder width makes for a practical functional sports shirt, each pattern is created in our own design studio taking the inspirations of the season and colour trends from around the world. 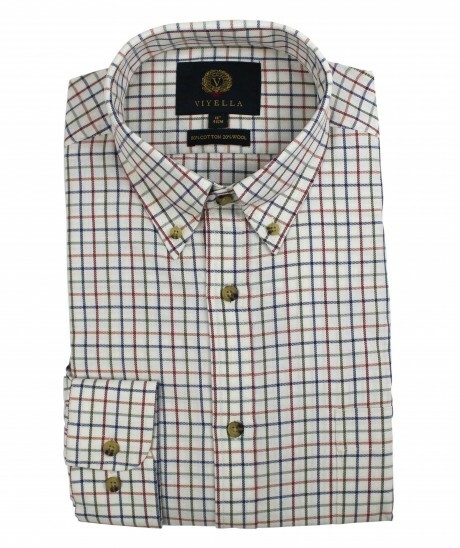 No two are the same and each design is Unique and exclusive to Viyella with design copyright, that we can guarantee. Our Classic tattersall check in varying shades of Plum, Green, Brown and Deep Blue. Button Down Collar, Functional Brest pocket matched to the design, Branded Viyella buttons, all positioned by hand reading the right way up & adjustable cuff.